Upscale 10700 Series Laminate Desks From Hon Features Real Wood Accents And Waterfall-Shaped Edges. This 72"W Right Credenza Features The Storage Capacity Of A Of A Lateral File. It Can Be Combined With A Left Return Or A Peninsula To Create An L-Workstation. To Create A U-Workstation, Combine It With A Left Desk And A Bridge. Laminate Color Is Cognac.. Upscale 10700 Series Laminate Desks From Hon Features Real Wood Accents And Waterfall-Shaped Edges. 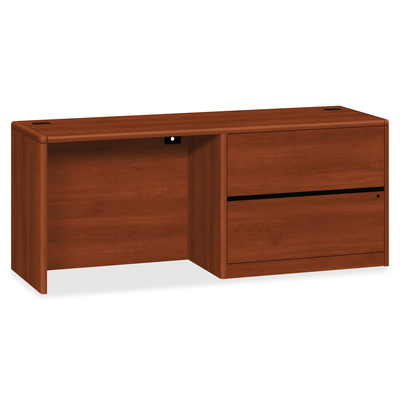 This 72"W Right Credenza Features The Storage Capacity Of A Of A Lateral File. It Can Be Combined With A Left Return Or A Peninsula To Create An L-Workstation. To Create A U-Workstation, Combine It With A Left Desk And A Bridge. Laminate Color Is Cognac.